Worker safety will always be just as important to us as plant sanitation performance. In fact, for PSSI going above and beyond to protect our workers is simply the standard we set and expect. Here are seven PSSI practices that we employ to keep workers as safe as possible during any sanitation shift. Ensuring worker safety starts with a commitment by management to thorough training and employee engagement. PSSI has established four stages of training for workers and customers. For the first 30 days on the job, each new worker is on-boarded by peer-to-peer observation of specific tasks. New hires also watch detailed safety videos that explain and visually demonstrate how the team is expected to work together to keep each other safe. Before every shift, our teams of workers stretch together. This approach helps employees prepare to be at their physical best and prevent possible sprains and strains among other injuries. Teams set goals for being accident-free. For example, “we want zero accidents this week.” Then when the goals are met, we celebrate the success at all levels. Our workers wear color-coded personal protection equipment (PPE) including helmets, goggles, gloves, smocks and more. This ensures at a glance that everyone is only handling equipment they have been properly trained for. We continually upgrade the PPE used, such as innovative boots and gloves designed to reduce injury. Worker safety also relies on PSSI’s process design innovation. We’re changing industry sanitation best-practices to turn equipment completely off before cleaning. If any employee sees equipment running, they are trained to shut it off. PSSI also requires all plant workers, regardless of role, to demonstrate lock-out and tag-out procedures before finishing their shift. Throughout the plant, signage visually represents any injury risks for additional awareness. During shifts, workers use verbal alerts and commands to help further prevent injury through creating awareness. 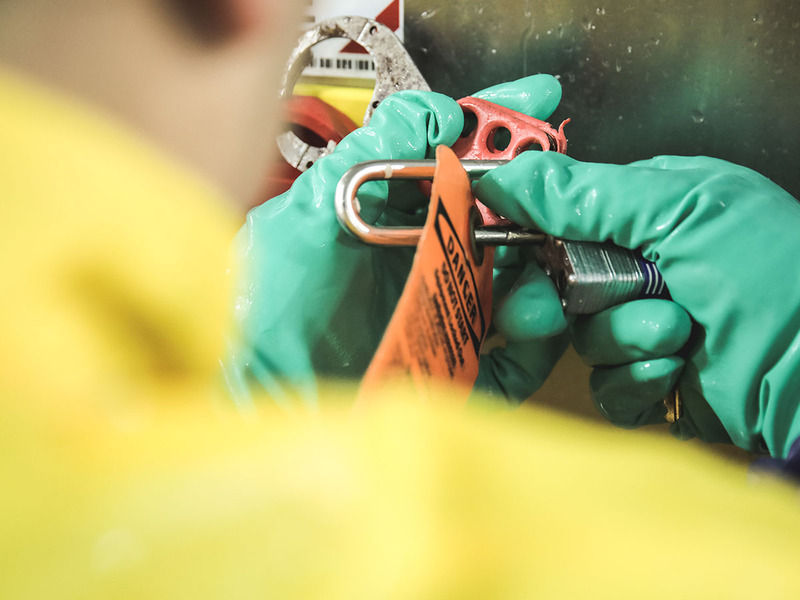 For example, when locking out and tagging machinery, a worker will give a verbal warning and then wait for a verbal acknowledgment before proceeding. Cross-training isn’t only for new hires. Teams take field trips on a regular basis to identify, discuss and solve safety hazards in all areas of a plant.